SAN FRANCISCO - Even before the Phillies arrived at AT&T Park to lose the first two games of their series against the Giants in uninspiring fashion, Charlie Manuel had his concerns. "A week ago, it seemed like we could score any amount we wanted," Manuel had said Saturday in Phoenix. "All of a sudden we're having a hard time. But that's the way it goes sometimes." The Phillies' offense has lost its ability to score at will. That precipitous fall continued Tuesday night in a 6-2 loss to San Francisco. 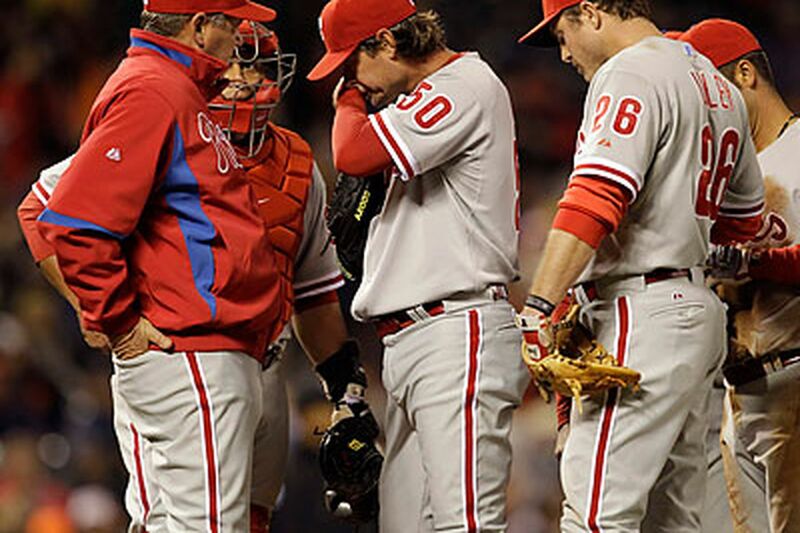 And now the Phillies find themselves in second place for the first time since May 29, 2009. With the Mets' six-game winning streak and the Phillies' 3-7 skid, New York moved a half-game ahead of the Phils. A weekend series with the Mets at Citizens Bank Park is coming up. Making matters worse, the suddenly anemic Phillies' offense faces two-time defending Cy Young Award winner Tim Lincecum on Wednesday before flying back to Philadelphia. It doesn't bode well considering that on Tuesday, the Phillies couldn't hit Giants starter Todd Wellemeyer, who went into the game with an 8.16 ERA. Wellemeyer had not lasted more than 61/3 innings in any outing this season. Against the Phils, he pitched into the eighth and allowed only three hits. The Phillies didn't put up much of a fight. One run scored on a sacrifice fly by Raul Ibanez in the second inning. The other came on Ben Francisco's RBI single in the eighth. Scoring has been a problem, not simply because the Phillies aren't hitting home runs. They aren't hitting with runners in scoring position, period. Through eight games of this nine-game trip, the Phillies are batting .200 (14 for 70) with runners in scoring position. Since Jimmy Rollins was injured April 15, the Phillies have averaged 3.6 runs in 12 games. They have scored six or more runs only three times in that span. Two key cogs in the lineup - Placido Polanco and Chase Utley - are a combined 4 for their last 41 at the plate. At this point, it would not matter if Jamie Moyer, Roy Halladay, or Steve Carlton were to take the mound for the Phillies. There is little run support. Moyer allowed four runs over six innings. He put 12 runners on base and allowed two home runs, but limited the damage. The lack of offense spilled over to the field in the seventh when Ryan Howard couldn't handle a scorcher lined at him and Utley committed a fielding error. It even led to gaffes on the basepaths. In the second inning, Howard led off with a rope to right field. He casually sauntered into second base only to be tagged on the backside by Matt Downs. That prompted some playful heckling from Giants fans. In the fourth, when Howard hit another ball to right, he stopped at first base and the crowd erupted in laughter. And after a hot start to the 2010 season, the Phillies are no longer the team doing the smiling.